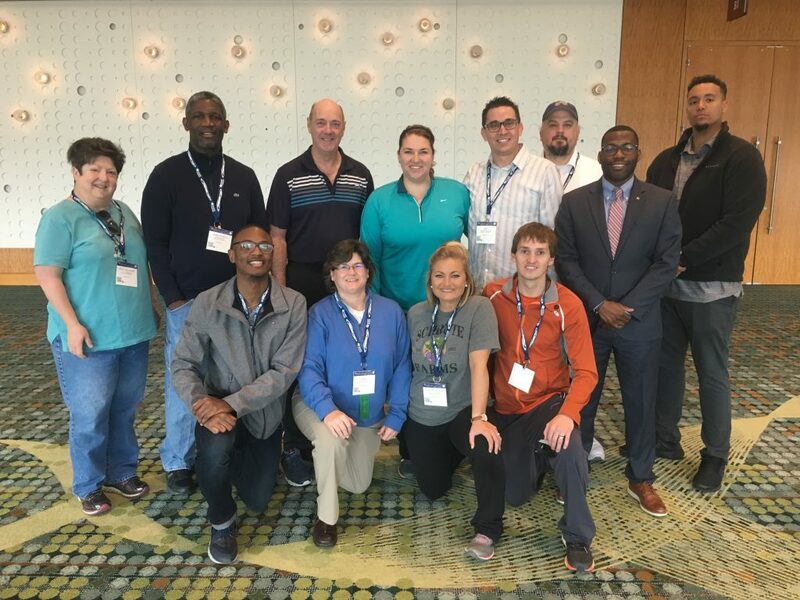 The School of Kinesiology had four Physical Education/Teacher Education (PETE) faculty and eight doctoral students participate at the 2018 Society of Health and Physical Educators (SHAPE) National Convention in Nashville, Tennessee March 20-24, 2018. Together they delivered 13 presentations at the conference. Additionally, Peter Hastie, Ph.D., Wayne T. Smith Distinguished Professor, and Sheri Brock, Ph.D., Associate Professor, won awards. Brock won the Fellow of the Society of Health and Physical Educators. 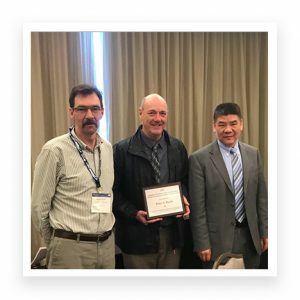 Fellow status is reserved for members who have made significant and sustained contributions to scholarship (research, creative, or scholarly activity) and related service in the areas of interest to SHAPE America. 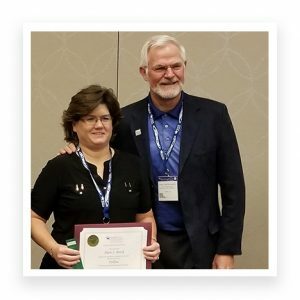 The purpose of Fellow status is to promote scholarship as an integral component of SHAPE America as well as to recognize accomplishments in scholarship by SHAPE America members. At the conference, Brock, Hastie and several graduate students, presented “Promoting Academic Success Through Integrating Classroom Content in Physical Education.” The session provided significant professional development for K-6 physical educators in failing schools to assist in contributing to the mission of the school in promoting reading and math performance. For example, students can be instructed to perform (i) a bounce pass if an “even” number is read, or (ii) a chest pass if an “odd” number is read. Another activity is “tag” where students must correctly answer math problems or state capitals to be freed. “Children’s and Teachers’ Perceptions of an Autonomy-Supportive Climate” (Alice Buchanan, Ph.D.; Benjamin Miedema; Jerraco Johnson; Mary Rudisill, Ph.D.; Melissa Pangelinan, Ph.D.). Expanded on current research demonstrating that autonomy-supportive climates (ASC) improve children’s motor skills and competence by showing that children as well as teachers prefer the process of learning and teaching in ASC. “Pokemon Go or Gone? Using Apps to Promote Physical Activity” (Jeffery “Kurt” Ward, Nikki Hollett, Andy Stringfellow). Study results indicated that users were more motivated to play the game because they had a target to reach (i.e. catch all the Pokemon) and were more conscious of playing for fun rather than improving their fitness. Hence, Pokemon Go was effective in promoting physical activity, at least in the short term, by motivating users with a target or challenge. “Instruction Matters: Purposeful Reinforcement is Needed to Learn Motor Skills” (Jerraco Johnson, Peter Hastie, Ph.D.). In the four conditions in this study, in the first two the teacher focused feedback on motor skill learning. In the third condition, children teacher’s feedback reinforced physical activity, while the fourth participated in free play and received no formal instruction. Moto skill feedback appears to be extremely critical as the groups that received specific feedback pertaining to motor skills learned their skills better than the groups that received physical activity reinforcement or no instruction. “Implementing Flipped Pedagogy in Physical Education: Technological Strategy for Efficiency” (Jared Russell, Ph.D.); the Flipped Classroom Approach (FCA) is identified as an effective method to implement technology and create a student-centered learning environment. Findings revealed 95% of the students preferred online learning and 84% enjoyed and had a positive attitude about the course online components. Hence, fitness trackers and other smart devices could improve classroom dynamics, encourage communication, collaboration, and creativity among students in PE and Kinesiology. “Effect of a New Games Unit on Secondary Physical Education” (Nikki Hollett, Jessica Richards). Students (n = 40) participated in a 4 week New Games unit consisting of Trench Ball, Hyper Ball, Flicker Ball, and Wacky Scooter Ball. Additionally, students participated in a traditional games unit to compare differences. Data collection included an 8 item questionnaire and pedometers to measure physical activity. Results indicated physical activity significantly increased during the “New Games” unit, although no significant differences in enjoyment level were indicated. The National Convention hosts 400 sessions featuring world-renowned speakers, honorees, athletes, and researchers. This year was the 133rd National Convention and the first ever “Shape Up Nashville – A Day of Play” event, a free health and wellness expo for all ages that was the finale of the Convention. The event was part of SHAPE’s “50 million Strong by 2029” campaign to put all children on the path to health and physical literacy. Pictured back row (left to right): Alice Buchanan, Ph.D.; Jared Russell, Ph.D.; Peter Hastie, Ph.D.; Nikki Hollett; Ben Miedema, Andy Stringfellow, Korey Boyd, Cory Dixon. Front row (left to right): Jerraco Johnson, Sheri Brock, Ph.D.; Jessica Richards, and Jeffery “Kurt” Ward.